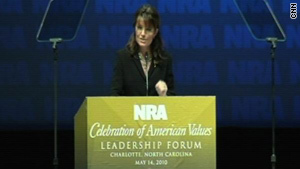 Sarah Palin, the former governor of Alaska, is a staunch supporter of the NRA. (CNN) -- Speakers at the National Rifle Association's annual leadership forum on Friday touted Second Amendment rights and also set their sights on the upcoming midterm elections. Sarah Palin told the crowd in Charlotte, North Carolina, that the "lamestream media" is using propaganda to make guns seem more dangerous -- and not the criminals behind them. "Criminals, of course, are to blame for crimes. It's the bad guys, not the piece of metal, that's to blame," she told the crowd. "Anti-Second Amendment gun laws don't offend them [criminals] -- they don't care what kind of gun laws are passed." When politicians attempt to ban guns, "all they do is take them away from law-abiding citizens and we use them responsibly," Palin said. Earlier, Haley Barbour, chairman of the Republican Governors Association, used his speech to rally support not only for gun rights, but for energized involvement in this year's midterm elections. The Mississippi governor told conservatives that they should not wait until 2012 to retake political control of the country. Instead, Barbour said, conservatives should focus on 2010, in what he calls "an enormous election." Although the anti-incumbent, anti-Washington mood of the country would appear to help conservatives and the GOP in the next six months, Barbour warned conservatives not to be complacent. Sen. John Thune, R-South Dakota, told the crowd there are two competing visions about the future of the country. "One consists of more government and less freedom, and one consists of less government and more freedom," he said. "And right now, unfortunately, the prevailing vision in Washington D.C. is that of government. More and more government." Barbour, Palin and Thune are among those considered possible GOP presidential nominees in 2012. Nearly 70,000 people are expected to attend the three-day event, which includes a series of meetings and exhibits. The NRA has long been considered an influential force in elections. Pictures of politicians holding guns are as ubiquitous as them kissing babies. So how influential is the NRA in the current political climate? It's hard to tell in the wake of two hotly contested Republican primary battles. Sen. Bob Bennett, R-Utah, had a high NRA rating and lost his bid to run in Utah's Republican primary. Former Sen. Dan Coates, who is opposed by the NRA, won the Indiana Republican primary, beating four other candidates. He now goes on to face Rep. Brad Ellsworth, a Democrat. Despite those races, one marketing strategist said politicians are still more apt to seek the NRA's support than oppose it. "In many ways they are better off going with the NRA, getting their support or avoiding their opposition as opposed to raising their ire," said Michael Maslansky. And that concept continues to fuel the NRA's targeting campaign. Ted Nugent, an NRA board member and former rocker, has anti-gunners on the run, with President Obama leading the pack. "We know that President Obama is against the NRA, but he's not going to speak about that because of the political suicide for those who have stood up in the past," Nugent said. Obama, however, isn't necessarily fighting hard for gun control. He signed bills that allow guns on national parks and on Amtrak trains. But perhaps it's the NRA lobbying arm in Congress which has a stronger influence. The group is backing a federal bill that would nullify the district's ban on semiautomatic weapons. Michael Brown, a Washington councilman who is fighting the bill, said that while this is a political year, the NRA "shouldn't be able to run roughshod over members of Congress." Nugent said it's really quite simple: "Tell your friends in D.C. that gun-free zones are murder capitals." The NRA's efforts also paid off in a case before the Supreme Court. The high court ruled in 2008 that a sweeping ban on handguns in the nation's capital violated the Second Amendment right to bear arms. It still will be illegal to carry handguns outside the home, and all pistols must be registered with police. Wayne LaPierre hailed the decision, saying it "vindicates individual Americans all over this country who have always known that this is their freedom worth protecting." Attempted terror attacks in Detroit, Michigan, and New York, coupled with a high level of government distrust, is exactly the climate in which the NRA's message thrives. "Here's an alert from Uncle Ted. The U.S. Constitution and the Bill of Rights is about Americans," Nugent said. "It's about all of us being individual and having individual freedoms and liberties." CNN's Carol Costello, Ed Hornick and Martina Stewart contributed to this report.